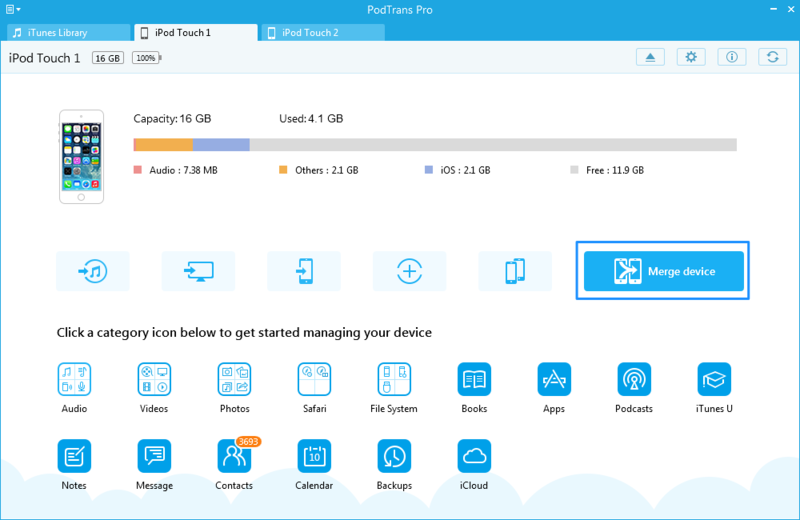 PodTrans Pro makes it possible to merge contents between iDevices without erasing existed data in the target device, including Music, Playlists, Movies, Ringtones, Voice Memos, TV Shows, Music Videos, Home Video, iTunes U, Notes, Message, Contacts, Calendar, Call History and App. 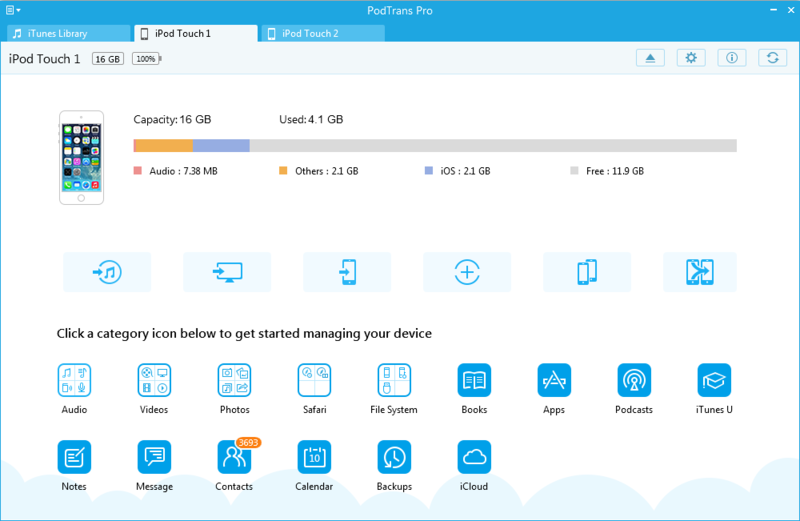 PodTrans Pro will skip the duplicated files in original and target device automatically. 1. Please connect both computer and device to internet when using Merge feature. 2. Please don't disconnect your iDevices while merging data, or the data will be erased permanently. So please ensure stable USB cable connection. Step 1: Launch PodTrans Pro after connecting two iDevices to computer. Then, you will see the main interface. Make sure the iOS version of iDevice is iOS 6 or later. And if the iPod Touch is iOS 6, you can view the data merged after restarting it. 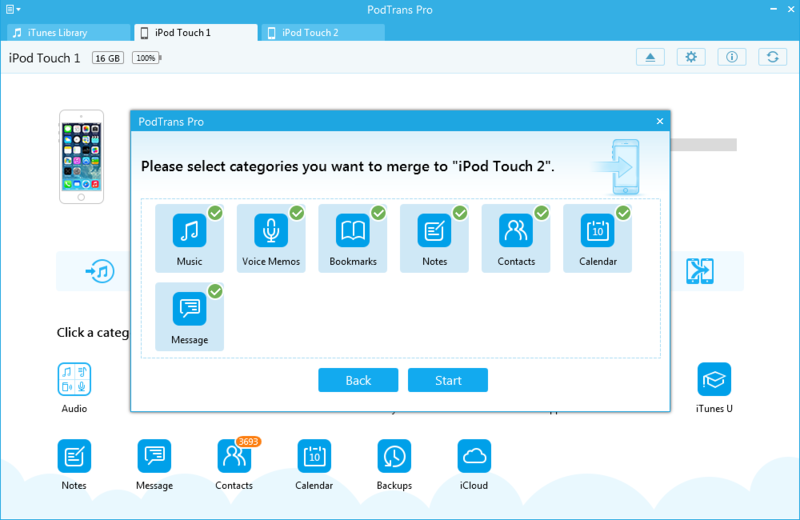 Step 2: Choose one iDevice as original device and click "Merge Device" button. Next, you will enter into merge management interface. If the iOS version of iPod Touch is 6 or 7, it can only merge iMessages. But if its iOS version is iOS 8, it can both merge text messages and iMessages. Step 3: Select data you want to merge and start the merge process. If the iOS version of iDevice (whatever original device or target device) is iOS 8.3, some apps and data can't be merged.